Tropical Storm Jongdari knocked out power to thousands. At least 16 people have been injured, NHK reported. 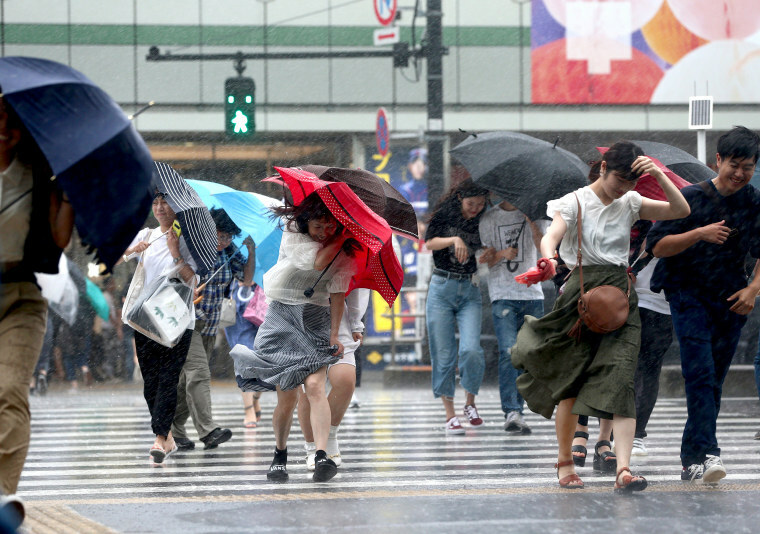 TOKYO — A tropical storm in Japan disrupted transportation and knocked out power to thousands of homes in its path as it headed west toward a region still recovering from devastating rains earlier this month. Tropical Storm Jongdari made landfall about 1 a.m. Sunday in central Japan after dumping heavy rain on Tokyo and other parts of eastern Japan the previous day. Downgraded from a typhoon, it had maximum sustained winds of 90 kilometers per hour (56 miles per hour) with gusts up to 126 kph (78 mph). Airlines cancelled many flights to and from the affected regions Sunday for the second day in a row, and train service was delayed or suspended. Electric utilities reported scattered power outages as the storm moved from east to west, NHK said.